THE SAME JURY that last month unanimously found Dylann Roof guilty in the slayings of nine black parishioners at a South Carolina church is returning to court to begin contemplating his punishment. With the 22-year-old representing himself, the process is sure to be unconventional. But even if Roof is sentenced to death, it’s highly unlikely he’d be executed anytime soon. While prosecutors plan to call up to 38 people related to the nine people killed and three who survived the June 2015 slaughter during Bible study at Emanuel AME Church in Charleston, Roof said last week he plans on calling no witnesses and presenting no evidence. Roof was found guilty last month on 33 federal charges, including hate crimes and obstruction of the practice of religion. A jury took less than three hours to return its verdict, and a judge dismissed the jury for a break over the holidays. Typically in what’s known as the sentencing phase, defence teams call relatives and other witnesses to testify about their client’s unsteady state of mind before and during the crimes. Given that background, the defence hopes, a jury might be more likely to spare the defendant’s life and opt against the death penalty. Roof also seems to be determined to try to keep evidence embarrassing to him or his family out. Not only did he take over his own defence, but he asked the judge at a hearing Wednesday if he could file a motion limiting what prosecutors can introduce. Neither Roof, nor US District Judge Richard Gergel nor prosecutors have given specifics on the evidence Roof is objecting to. On Thursday, Gergel ordered another competency evaluation of Roof “in an abundance of caution,” after his standby counsel filed a sealed motion again questioning Roof’s mental ability to proceed. The judge’s order specified he saw no reason to delay tomorrows start of the penalty phase. Roof’s lawyers tried repeatedly both to stop him from being his own lawyer and to work mental health-related evidence into the first phase of his trial, saying they feared Roof fired them because he feared they would present evidence that would embarrass him when trying to save his life. Prosecutors objected at every turn, and Gergel wouldn’t allow any of it into court, ruling mitigation evidence is allowable during sentencing and not before. Court papers show prosecutors are expected to present evidence showing that Roof picked his victims because of their race, killed them to incite more violence, showed no remorse and killed three particularly vulnerable people who were 70 years old or older. “The Dylann Roof case is a classic example of the type of problem you can have when an obviously mentally ill or emotionally disturbed defendant is permitted to represent himself,” said Robert Dunham, executive director of the Death Penalty Information Center. There’s a huge difference in the eyes of a jury between someone they perceive as evil or despicable and someone they perceive as being seriously mentally ill. … If you take mental health out of it, you are putting a thumb on the scale of death. Both the judge’s decision to allow Roof to represent himself and waive the introduction of mental health evidence are sure to be raised in an inevitable appeal, Dunham argued. 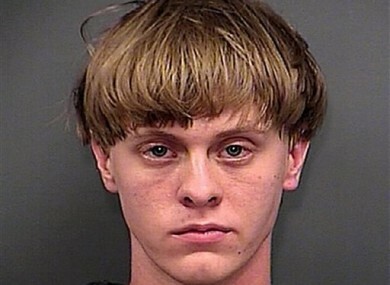 Whether he’s sentenced to death or not, it’s unlikely Roof would be executed anytime soon, in either jurisdiction. The federal government hasn’t executed anyone since 2003, and there are years of appeals between a death sentence being levied and carried out. Email “White supremacist Dylann Roof will not rely on psychiatric evidence, calling it 'a Jewish invention'”. Feedback on “White supremacist Dylann Roof will not rely on psychiatric evidence, calling it 'a Jewish invention'”.